As this administration continues to threaten migrants with deterrence measures like family separation and calls for increased funding for border security and deportation forces, migrants transiting through or being turned back to the other side of our southern border face Mexico’s highest rates of violence in the last two decades. Most of these migrants are families and unaccompanied children fleeing unabated violence, corruption, and insecurity in their homes in the Northern Triangle countries of Central America—many fearful of returning to their communities. Yet instead of offering them due process and a chance at receiving international protection, since the end of 2016, Border Patrol agents have done the exact opposite. Civil society organizations have documented how, despite claims of fear to return to their home countries or intentions to seek asylum under U.S. law, agents are turning away migrants at various ports along the U.S.-Mexico border. At the end of December 2017, apprehensions made on the U.S.-Mexico border remained lower than figures from the same period in 2016 and 2015, but continued to demonstrate an uptick in numbers since May 2017. Moving ahead with expanded efforts to restrict access to asylum at the border, tightened credible fear standards, and separation of families at the border could mean that more migrants will be increasingly turned back to or stuck in Mexico’s northern border region. And with that, face increased violence and human rights violations, such as homicides, disappearances, kidnapping, and extortion in Mexico’s northern border states of Baja California, Sonora, Chihuahua, Coahuila, Nuevo León, and Tamaulipas. In the first 11 months of 2017, the Mexican government tallied 23,101 murders, making last year the deadliest on record since the government started keeping track two decades ago. To put those daunting numbers into perspective, a recent study shows that no other country in the Western Hemisphere in the past 20 years saw as large an increase in homicide rates and numbers as Mexico. Among the states with the highest number of homicides through November 2017 are the border states of Baja California and Chihuahua. Between January and November of 2017, there were 1,915 murders in Baja California compared with 1,180 during the same period in 2016. In fact, the homicide rate in Tijuana is so high, it’s on par with the murder rate in El Salvador, a country consistently ranked as one of the most violent in the world. Less than halfway through December of 2017, the city of Tijuana, alone, clocked in 1,500 homicides, the most ever in its history. Despite this, U.S. officials in San Ysidro ports of entry, unable to handle the influx, left nearly 100 migrants stranded and penniless in the streets of Tijuana, defenseless in a city of record-breaking violence. They slept in the plaza in a line, terrified of losing their chance to seek safety and asylum. Between January and November of 2017, there were 1,425 murders in Chihuahua. Of these, 681 murders occurred in Ciudad Juarez, representing a 23 percent increase in homicides compared to in 2016. Last year’s rate was also significantly higher than that of 2015 and 2014. And in the first four days of 2018, there have already been 18 murders in Juarez, 12 in the span of an hour and a half. But it’s not just an increase in overall numbers that’s concerning. In those 11 months of 2017, 87 of the murders in Ciudad Juarez were femicides, representing a 35 percent increase in women murdered than in the previous year. We already know that gender-based violence is likely for migrant women—nearly a third surveyed for a report released in May 2017 confirmed sexual abuse in transit. And these incidents are likely much higher, however, many go reported. 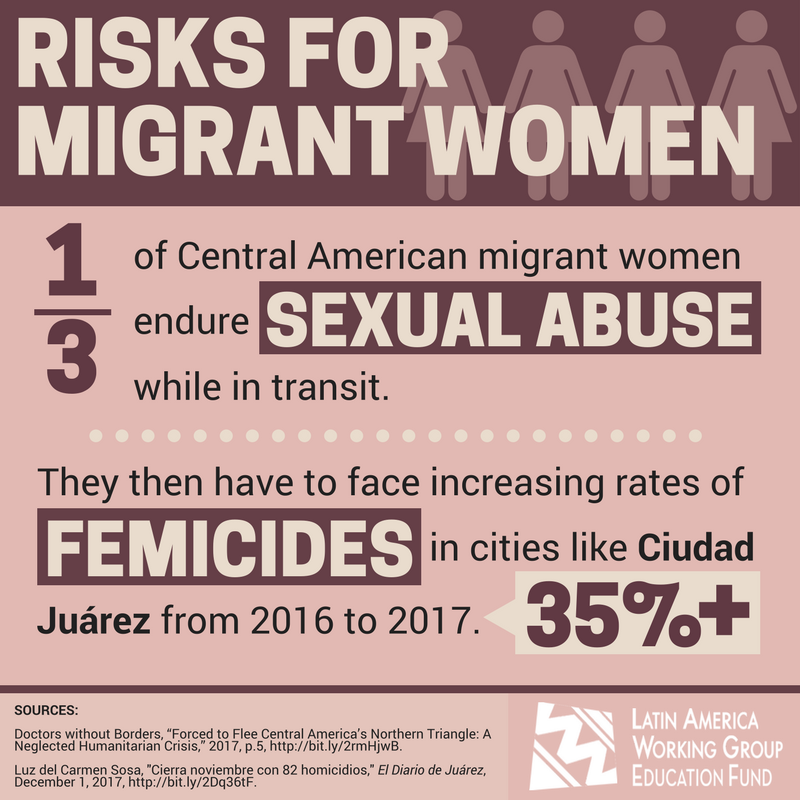 Migrant women now not only continue to face violation on the trail but also increase rates of femicides in cities like Ciudad Juarez. Death isn’t the only danger confronting migrants. In fact, the U.S. Department of State recently issued a travel advisory for Mexico stating that “violent crime, such as homicide, kidnapping, carjacking, and robbery is widespread,” advising citizens to “reconsider travel” to Chihuahua, Coahuila, Nuevo León, and Sonora and not to travel to Tamaulipas. But while the U.S. warns its citizens, it’s simultaneously turning back migrants and asylum seekers to these very states. There have been documented cases of migrants being turned back only to fall prey to kidnappers. For instance, a single mother and daughter seeking safety in a migrant shelter in Reynosa, Tamaulipas paid coyotes to bring them into the U.S. But the truck they were being smuggled in flipped, leaving the daughter dead and the mother severely crippled. After the mother was denied asylum, she was deported and kidnapped before even having finished crossing the bridge into Mexico. Yet she was lucky—her family paid the ransom and two attorneys and two representatives of human rights defenders secured her entry back into the U.S. Although the outcome of her story is unique, the events leading up to it are not. Nuevo León, Tamaulipas has Mexico’s second highest rate of extortion. In August 2017, the rate increased 48 percent compared to in July. Mexico’s northern border states, such as Tamaulipas, Coahuila, Nuevo Leon, and Chihuahua, also continue to rank among the states with the highest number of registered disappearances in the country. Enforced disappearances are carried out by organized crime, Mexican law enforcement and armed forced, often acting in collusion with each other. 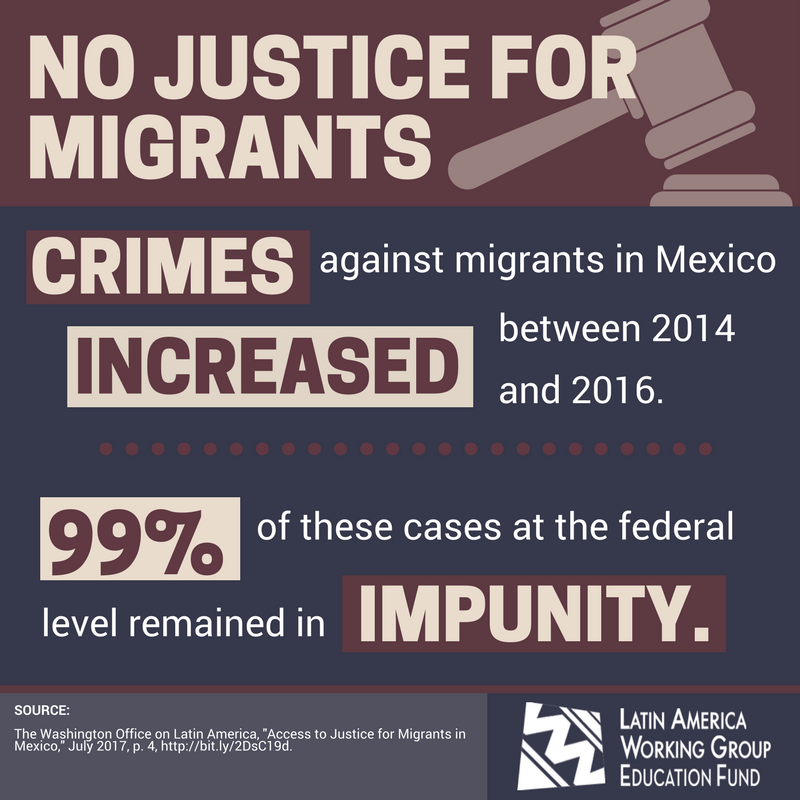 Migrants also continue to experience other crimes such as extortion, robbery, and sexual assault. Such cases documented by migrant shelters in Sonora and Coahuila involve the Federal Police and organized crime. In 2016, the shelters documented an increased number of crimes against migrants, yet approximately 99 percent of the crimes remain in impunity. The current administration’s consideration of proposals to separate families as a deterrence measure at the border could drive these families, children, and individuals further into the hands of smugglers and to these dangerous conditions along the Mexican side of the border. Migrants will be forced to find alternative ways to enter the United States rather than presenting themselves at border ports of entry to seek asylum. While the administration has voiced concern regarding smuggling, the measures it is considering would only worsen it. What they wouldn’t do is improve safety conditions along the border. Instead of focusing on deterrence measures that won’t work, limiting already restricted access to asylum and further criminalizing asylum-seekers, the administration should focus on providing all asylum-seekers with due process at the border and a chance to present their claims for international protection. Border Patrol agents should be held accountable for illegally turning away asylum seekers or separating families–leaving them to danger on the Mexican side of the border. There should not be an increase in Border Patrol agent hires without measures to hold them accountable for rights violations. And increased funding for border security should not see approval without consultation with border communities or for walls or infrastructure that will unnecessarily harm communities and the environment.